Network Meter is probably the best all-in-one wireless and wired network related system monitoring gadget for Windows. Network Meter shows your private IP address, public IP address, SSID, and wireless signal quality. 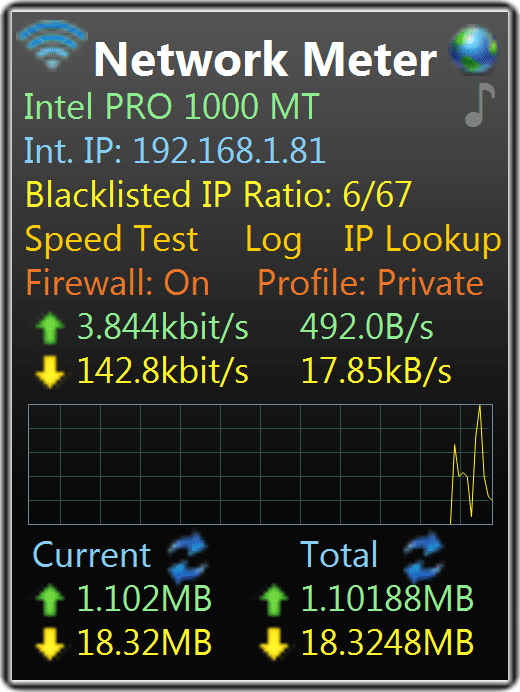 Network meter also shows your current upload and download usage and keeps a running total. If you have any interest in the current state of your network connection, and the data moving across it, you'll love Network Meter. The Network Meter gadget works in Windows 7 and Windows Vista. This gadget is so great for keeping tabs on network usage but can be a pain if you're using both wired and wireless networks. On wireless networks, Network Meter also shows your current SSID, signal strength, and security status. The current amount of data being downloaded and uploaded is shown in a live stream in the gadget. Size and color are configurable far beyond what gadgets typically provide. Network Meter is an excellent network monitoring gadget for Windows 7 and Windows Vista. This gadget shows everything that you might want to know about the current state of your network connection. Network Meter works just great "out of the box" but can be tweaked in about every way you could imagine, making it a highly customizable Windows gadget. If you use a lot of gadgets, you know how important customization is. When configured for a wireless network, the Network Meter gadget will show your current SSID, plus your signal strength and if your connection is secure. In addition, and also for wired networks, your current IP address, both internal and external, are displayed right on top, followed by easy one-click access to an Internet speed test and IP lookup service. Curious how much data your computer is sending or receiving right now? The Network Meter gadget shows you that in a live, 1-second updated (this is customizable) stream right on the gadget. Network Meter is a free download available from AddGadget. See How To Install a Windows Gadget if you need help. I really liked Network Meter. There are several network management gadgets available for Windows 7 and Windows Vista but Network Meter is certainly one of my favorites. This review is based on Network Meter v9.6. Please let me know if I need to update this review based on a new release of Network Meter.